The UKC Rankings for Events through March 30, 2014 have Deuce ranked as the Top Silken Windhound as of the end of the first quarter of 2014. He had gone with Victor to shows in Hutto, taking Best of Breed all 4 shows that weekend, and then he won a couple more at the Denton shows in early March. Needless to say, I am quite proud of the “White Tornado”! Of course he is likely to move down from there for a while as we likely will not make it to any more UKC shows until after showing at the Premier in June (where Pasha will be competing in the Top Ten Invitational, defending his #1 spot from 2013). Hopefully Deuce the Doof will pick up steam again in the late summer! 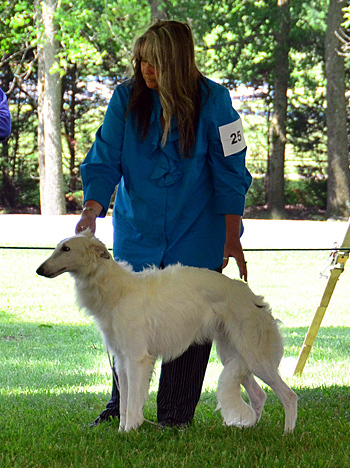 Deuce is pictured showing at SilkenFest 2012 in the 12-18 Month class.